I of the Enemy: Ril'Cerat is a totally free, stand alone, science fiction real-time starategy game, that is the first chapter in the "I of the Enemy" saga. The player is a Lokob (luh-kobe) officer who is in charge of his race's contingent. Major Verkkal (voice talents of Ian McNeice, famed for his role as Baron Harkonnen in Dune) is his trusted friend and Field Commander. 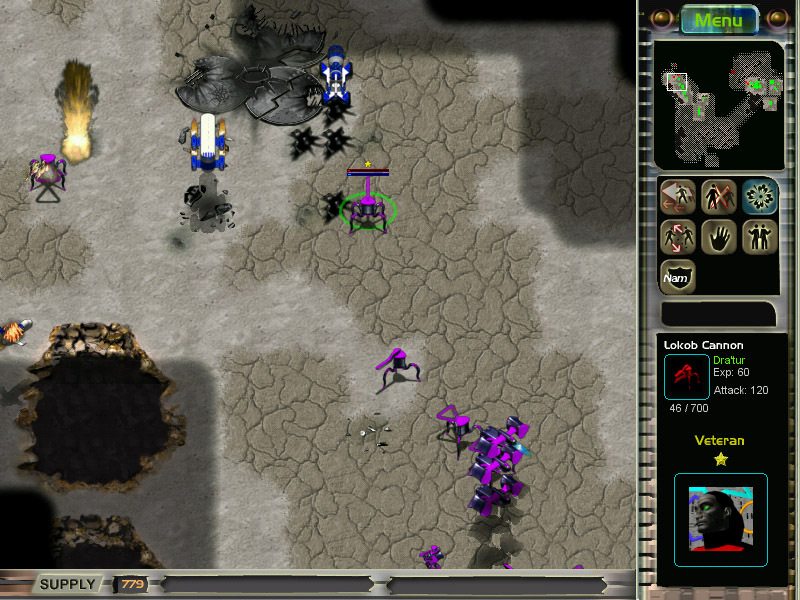 Emphasis in this game has moved away from gathering, mining and building, and instead concentrates on interesting tactical problems. Realistic facets of combat include reinforcements arriving according to an Order-of-Battle (which may be misleading due to poor intelligence), via a temporal gate. Indirect fire weapons (artillery) targeted by spotter units discourage fixed defenses. Each unit visibly changes as it advances in experience, toughness and morale rating, and can be carried forward to the next exciting missions as a trusted member of your team. "Advanced" units acquire heavier weapons or equivalent combat advantages. Success in battle is achieved through maneuver rather than larger quantities of units. This makes it more important for players to achieve favorable match-ups, rather than just waiting for overwhelming numerical superiority. This site does not contain serial number, crack, keygen I of the Enemy: Ril'Cerat serial number : serial number is the simplest type of crack. A serial number(cdkey,product key,etc) is register the program as you may already know. a crack or keygen may contain harmful software. If you cannot find the exact version you want, just give it a try. for more information read .nfo/.txt/.diz file include in zipped file.